In his chapter “How Is Society Possible,” Georg Simmel inquires into the unity of society on the basis of an analogy derived from Kant concerning the question of the conditions of possibility of nature. While for Kant nature is synthesized by the mind’s activity so as to structure it, Simmel argues that society is unified without the need for an observer, even if there can be an additional synthesis by an outside observer in terms of a spatial metaphor (6-7). In any case, there is arguably no need for an observer because the elements of a society are individuals investing their psychic energies in such a way as to already be absorbed in the relations that unify it (7). Nevertheless, the answer Simmel derives via the analogy with Kant’s question does not necessarily satisfy him from the start, for he declares that the entire contents of his monumental Soziologie will be devoted to it: “it inquires into the processes—those which, ultimately, takes place in the individuals themselves—that condition the existence of individuals as society…not as antecedent causes of this result, but as part of the synthesis to which we give the inclusive name of ‘society’” (8). In other words, Simmel’s question does not allow for a simplistic solution in terms of abstract conditions of possibility, since it continues to question in what sense the “concrete processes in the individual consciousness” correspond with “processes of sociation”, and how these processes inform how there can be a “production of a societal unit out of individuals” (8). On the basis of these reflections, Simmel will argue that sociation or association (Vergesellschaftung) should therefore be conceived as “functions or energies of psychological processes” insofar as it involves the interaction of concrete individuals; nevertheless, in abstract terms that may not necessarily be realizable, it can also be conceived as “ideational, logical presuppositions for the perfect society” (9). In this sense, individuals are the society they deserve, insofar as they are at the basis of their actual interactions and their idealizations of the perfect society which is from the start fueled by their psychic energies. All of us are fragments, not only of general man, but also of ourselves. We are outlines not only of the types “man,” “good,” “bad,” and the like but also of the individuality and uniqueness of ourselves…it is precisely the practice of life which is based on…the transformation of the given fragments into the generality of a type and into the completeness of the ideal personality (10-11). It is because the individual is invested in but not wholly subsumed by social life that Simmel can note that “life is not entirely social” (14). There may be unities, but these unities belie the fact that they did not exist prior to the fragments that crystallize. This is why it can be said that because society is not perfect in the ideational sense we can have some reprieve, so to speak, from the social; the context of our fragmentation leads to the feeling designated by that ‘logically uncertain concept ‘freedom’” (15). The fact that life is not entirely social also implies the same for nature, and an immediate analogy can be drawn with the natural realm: “man comprises nature in spite of the fact that it is independent and very often hostile; that which is, according to man’s innermost life feeling, outside of him, must necessarily be his medium and element” (16). Society, too, is problematically felt to be a medium that overwhelms, incorporates and is incorporated by the individual, short-circuiting the difference between inside and outside or at least reducing it to a difference of degree than a difference in kind. This isomorphism between the natural and the social is the starting point for an investigation of the basis that undergirds them along with the psychological processes that make their unities possible, namely the domain of the biological. Since society can be conceived as a “general elaboration of a fundamental form of general life”, it is necessary to discover the vital basis for the possibilities of these forms. Although certainly for Simmel and in general, life as such or the category of the vital perhaps cannot be reduced to the biological as a specific domain of knowledge, it is important to note that biological structures form the continuity of interactions on the levels of the social and the psychological. Simmel sums this up by arguing that we should be understood as products and members of society, bypassing the one-sided view that individuals may simply be “vessel[s]” that would carry the mixture of historical and physiological accumulations of the species: “By our life and its meaning and purpose, we are as inextricably woven into society, as a synchronic, coexisting phenomenon, as we are, as products, into diachronic, successive society” (16). Society allows for that degree of freedom that provides the species with the means to not simply be reduced to vital reiteration and historical redundancy (this is the question of the sociological extremes of considering individuals or social phenomena on the basis of society or the human species). In terms of nature, we involve a “circulation of natural forces” that pervades our “completely self-less structures”, and so our existence logically follows the necessities of the laws of nature (16). In the same sense, Simmel draws the analogy between the natural or biological and the social, arguing that insofar as we are social and lifted beyond the individual realm, we do not “live around any autonomous core” but exist in a nexus of interactive or reciprocal relations with others (16). This analogy holds for Simmel due to the fact that categories like the “social” and the “individual”, however abstract, ultimately share the same contents[i] (16). Nevertheless, this analogy sometimes may seem to be taken to the point where it threatens to dissolve into a simple metaphor or resemblance translated among disparate domains. For example, in terms of the dual position that sociation involves with the individual, Simmel will write that “[the individual] is both a link in the organism of sociation and an autonomous organic whole; he exists both for society and for himself”[ii] (17). It is extremely important to note that Simmel does not divide the organic on the side of the individual exclusively or vice versa; he does not take the physico-biological as the pyramidal base for the hierarchization of a structure leading towards an apex that would culminate in the social through its psychological midsection. In other words, he does not produce a certain verticality that would be reminiscent of a Platonic idealization of life culminating in another world of Forms. Sociation is an organism[iii] with individuals as links just as these individuals themselves are organic wholes. In any case, the analogy with the organism is also meant to evoke the notion of unity, insofar as the individual’s existence involves “two logically contradictory characterizations”—both member and product, function of it and autonomous center (18). The organism (or perhaps for Simmel, life itself) exemplifies the maintenance of this tension and the principle of reciprocal interaction by embodying this dualism or its overcoming, by providing a solution to irresolvable incompatibilities. In light of this, there is an important footnote in Simmel’s chapter on ‘Conflict’ treats the conceptions of life that consider it to always have two opposing parts, while the other conception “lets the whole really be the whole”, i.e. a “wholeness which covers both strictly-speaking unitary relations and dualistic relations” (72-73). In other words, “Life constantly moves between these two tendencies…It makes the unity, which after all comprises both contrasts, alive in each of these contrasts and in their juncture”. Thus life brings to light conceptual juxtaposition of the organism and society to have certain overlapping domains, precisely that of conflict and unity. Just as the individual may struggle with others in monetary exchange, or perhaps with societies themselves as concrete environments of exchange, for example in the metropolis with its violent stimuli, in the same way the organism struggles in its environment against other hostile organisms and situations. While this example may be flawed due to the fact that it seems to justify metaphor with metaphor, Simmel persists in his usage of analogy[iv] and insists on the structural analogy of organism and society through the notion of unity, and gives it an empirical justification: “For unity in the empirical sense of the word is nothing but interaction of elements. An organic body is a unity because its organs maintain a more intimate exchange of their energies with each other than with any other organism; a state is a unity because its citizens show similar mutual effects” (“The Problem of Sociology,” 23). [v] Thus societies are analogous to the organism through their unity, but more essentially through their capacities for reciprocal interaction which involves an exchange of energies; this is why groups are able to develop “functional” or “social organs” that tie group elements together on the basis of interactions that involved “disproportionate expenditures of energy” (“Group Expansion and Development of Individuality,” 292-93). There is another, perhaps deeper reason for the resonance of this mapping of the biological and the social, and that has to do with the fact that in “The Problem of Sociology” Simmel seems to want to base his idea for a science of society on the model of the science of life (25-27). Yet this mapping of the science of life does not require mimicry or even an extensive study of biology in order to be fruitful: “The science of life did not establish itself on a firm basis until it investigated specific processes within organisms—processes whose sum or web life is” (27). In this sense, the life sciences have moved beyond simple structures or organs to the underlying processes that allow for individuation to take place. This enables Simmel to make the point that it was not until science stopped thinking life ‘as such’ or in general that life was able to be studied for the processes and interactions that it involves. 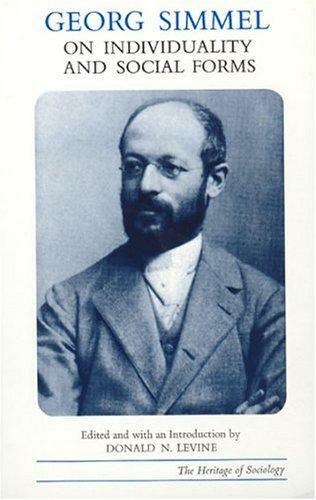 Unlike Freud, who struggled under the weight of a certain biologism or early intimation of thermodynamics that stemmed from a desire to model psychoanalysis after the sciences, Simmel is attempting to isolate a structural equivalent in the sciences of life that can prove fruitful for the schematization of a science of society. Here, there is no transfer of technical biological vocabulary or what could be called an attempt to model the concepts of sociology on the basis of the concepts of biology. Simmel is not interested in a methodological intervention, but the conditions of possibility of a knowledge of society in terms of the interactions involved with society. More importantly, however, it allows Simmel to base his sociology on an analysis and synthesis of the social forms of interaction, thus simplifying the domain of sociology in a way similar to the way morphology studies forms and not formations, for example. This problem of isolating the form from the content—which Simmel again and again says is only an operation of abstraction and not the reality of the lived situation—will never fully satisfy Simmel’s ideals, and it will return in the question of the relation between life and form. Here, the question is different and it seeks to clarify the transcendental constitution of sociology as a science. For Simmel, sociology as the science of the “purely” social aspects of man “is related to the other special sciences of man as geometry is related to the physicochemical sciences…Both geometry and sociology leave to other sciences the investigation of the contents realized in the forms” (28). Sociology and geometry deal with pure types or idealizations, at least insofar as they remain towards the side of the ‘purely’ social or geometrical. In fact, Simmel notes there may be no sure way to perform an analysis of form and content, especially considering that “the isolation of truly pure sociation out of the complex total phenomenon cannot be forced by logical means” (31). Even when sociological concepts are applied successfully, there is always the possibility that certain elements do not always obey the form and content distinction, rendering it arbitrary (33). Thus, while sociological givens are psychological processes, these processes—taken as ‘contents’—are subsumed under psychologically categories in individual lived experience. While these categories may be necessary to understand the experiences themselves, they make it difficult or unwieldy to sociologically register the “objective reality of sociation” (35). Perhaps we can say, looking ahead, that Simmel is aware of the traps that he may fall into by concentrating his sociology on the exclusive domain of forms—which, as he notes, cuts these forms from the contents without which they could not live. Simmel may have ‘given up’ on a sociology of life, or realized that a sociology of forms would need to be supplemented with a philosophy of life that could translate its cognitions back into life in order to think life on its own terms, life qua life; the fact that he did not ‘succeed’ in ‘founding’ such a sociology or philosophy does not at all result in the proposition that Simmel failed in these areas, for he both thought a sociology on the basis of its conditions of possibility and repeatedly question the legitimacy of such a ‘pure’ undertaking. In this sense, even towards his own thought he proved what he would argue for later, namely the fact that knowledge, by confronting its own boundaries, transcends those very boundaries at the same time, thus proving the “real infinity of vital movement on the level of the intellect” (“The Transcendent Character of Life,” 358). In short, the difficulties that Simmel runs up against suggests that he has an intimation that what is being left out by pure sociology is the transcendence of life in terms of its intimate ties with individuation, i.e. that which does not allow form and content to be grasped in isolation fully, as though through the pretenses of the hylemorphic model. This haiku takes up and extends some introductory questions of Raymond Ruyer’s Genesis of Living Forms, namely: how is there an isomorphism between form and formation; what leads from an iso-amorphism to an isomorphism? How to think, not structures that exist after individuation, but the operations that allow for structures to be generated? And, through these difficulties, how to think the knowledge that results insofar as it rests on structural correspondences? (5-9). Gilbert Simondon will attempt to account for some of these difficulties in his investigation of the hylemorphic model. In his primary doctoral thesis The Individual and Its Physico-Biological Genesis, Simondon begins with the assumption that the principle of individuation is prior to definitions of form and matter. The example he uses in the first chapter of this work is simple and quotidian. He considers the production of a brick through the interaction of a three-dimensional rectangular mold and a ball of clay. In a basic sense, the hylemorphic model reduces the event of the interactive forces (reciprocal relations) between the matter and form in order to concentrate on the two abstract givens. This model therefore skips over the entire process that allows for this clay and this mold to be understood as entering into direct communication of forces here and now under determinate conditions. In a sense, the hylemorphic model resembles a particular aspect of the Marxist model of alienation in terms of the sphere of commodities: (in the market as consumers, we see the banana, not the sweat involved with the process of labor, transportation and marketing, etc. In other words, the model reduces labor to a magic show and the reproduction of the commodity to natural immediacy). Indeed, this symmetry with Marx should not be too surprising, and this will lead Simondon to argue that the hylemorphic model persists because it in fact is neither based on vital reality nor technology operation, but on a certain social mediation between the two. It is this social aspect which is tied to a certain division of labor that needs to be unpacked if we are to unearth the foundations of the hylemorphic model that attempts to lay claim at a certain form of universality. As soon as Simondon begins to deconstruct the problematic aspects of the hylemorphic model, he already shows that it leaves many things out of the account. First, it is obviously impossible to think of a purely formless matter or a form without matter except apart from a concrete, lived situation; in the same sense, the matter of the clay, for example, has to be prepared in a certain number of ways (it must be dug out of the ground, sifted, purified of extraneous materials like pebbles and roots, it must be of a certain viscosity and wetness to take on a future form, etc.). The preparation of the clay involves a certain amount of labor that seems to go without saying for the hylemorphic model. On the other hand, the form, too, must be prepared (in a foundry, for example) in such a way that clay does not stick to it after removal, that it can hold and not deform too significantly during the molding process, and that it does not leave any cracks, fissures or air bubbles in the clay during the process (among other things). And all of these preparations are necessary to the extent that the ideal of the finished product (here, the brick) is conceived as having a purely homogeneous reality—that it is uniform in structure throughout. The hylemorphic model only makes sense in terms of this homogeneous reality, for what is desired is an individual which, after individuation, will be conceived as having an internal stability which is antithetical to the real metastability of the interaction of the clay molecules and the walls of the mold the moment when a field of energy places them in communicative interaction (the situation that makes individuation possible). It is in this sense that Simondon will note that the matter is in a position to be in-formed by the mold because it can serve as a vehicle for the potential energy that will result from the reciprocal reaction of the clay and the pressure of the walls of the mold. It is in this moment that the form and the matter are dynamically interacting in such a way that one cannot say that the form is ‘acting’ on a ‘passive’ matter. Indeed, Simondon will go on to say that it is preferable not to speak of form acting on matter, but to conceive of the shape of the mold ‘acting on’ (really, interacting with) the shape of the clay. One of the main pitfalls behind the simplicity of the hylemorphic model is both the reductionist way in which it conceptualizes individuation and the way in which its presuppositions guarantee it a sort of universality and applicability throughout various fields. Simondon argues that it seems to involve a reciprocity between the technological field and the vital domain such that a dualism of substances results: form is the order of the master, while the matters are not of the latter’s concern insofar as his slaves are the ones who acquire and prepare these matters. For Simondon, form is basically reduced to the master’s order-words, for it exists on the level of the expressible. This way of polarizing activity on the side of form and passivity on the side of matter only makes sense if it presupposes the existence of a certain type of social hierarchy. It is not necessarily Simondon’s main goal here to renovate a theory of alienation in terms of technological schemata (although he does in some sense engage in such a theory in principle by trying to refute the anthropological independence of man from the rest of the living contra Heidegger), but to show how a certain model which seems to extend to virtually all areas of life is at base expanded from a contingent stability of social structure. In this sense, the stability of the products of the model itself inheres in its social foundation which would find such a stability to be the mirror image of its own power and perseverance. Simondon will contrast this technical abstraction of the hylemorphic model with what he takes to be the principle of individuation: namely, that the principle of individuation is an operation and cannot be understood on the basis of structures alone. In other words, the crux of the matter is to think the individual on the basis of individuation, and not the other way around. This is why Simondon will conceive genesis and the principle of individuation as essentially the same thing. Genesis is not the before or after of individuation, but on the same level as the form and the matter within a system of energy potentials or field of forces. Thinking the brick apart from the field of forces that inspired its taking form in a mold—in other words, thinking it hylemorphically—is always possible and perhaps preferable, especially if one is only worried about bricks or things ‘in general’ apart from the creation. This makes more sense when we remember that the brick undergoes a molding, which in some way is considered to be a momentary individuation that will not become subject to future individuations (the brick is stable and not metastable, so even if it were broken down to dust and reassembled into another brick, it would be a new individual and would require another individuation, which would also be conceived in terms of its ultimate stability). This is a roundabout way of saying that the brick is not alive, but the important thing to remember is that the hylemorphic model literally cuts the brick, and everything else that comes into its fold, from life, and it does so by assuming that life somehow exists after or before the appearance of the individual, rather than contemporaneous with its ascent into existence. Again, it does harm (to thought and to life?) because it fails to appreciate the specific nature of the interactions and instead focuses on the products of the latter, which ultimately cannot be thought without these interactions in general. Before returning to Simmel and his explicit turn to questions concerning life, we should note the main differences between molding an inorganic brick, for example, and the continual and variable molding of a living being, something Simondon likes to call modulation in reference to electrical transductors. Unlike molding with its once-and-for-all principle of individuation, modulation implies that there is a molding which develops an ongoing and variable individuation that serves as irreversible stock for future individuations. In A Thousand Plateaus before going on to discuss what they call Nonorganic Life (an esprit de corps of matter) Deleuze and Guattari remark how this notion of modulation opens up the avenue for their own off-the-beaten-path concepts: “Simondon criticizes the hylemorphic model for its taking form and matter to be…like a simple relation of molding behind which there is a perpetually variable, continuous modulation that is no longer possible to grasp” (408). What molding according to this model hides is the fact that the living being does not ultimately become independent of the pre-individual milieu from which it sprang through the course of its initial individuation. Modulation, as the principle of vital individuation, expresses the fact that the individual carries with it this charge of the pre-individual milieu and continues to structure and restructure itself through its incorporation of potential energy (in Nietzsche this principle seems to run all throughout Twilight of the Idols insofar as it is a work of convalescence and regeneration, a work of cheerfulness in the course of traversing opposites, and not to mention a work that is still attempting to rethink the concept of becoming[vi]). Regeneration, for Nietzsche, is the primary example of this incorporation of potential energy, and thus it implies the will to power which overcomes itself through its gradual increase in strength. In his essay on “The Adventure,” Simmel contemplates the essence of a particular form of experiencing that places the elements of life in a new and unprecedented contrast with the normal modes of existing (197). This notion of the adventure as a form of experiencing, and not as a content, not as an accumulation of events or chance occurrences, is important insofar as it emphasizes that the adventure is not a question of what happened in general, but the realization of how a life and its events take on new significance and intensity: “adventure accentuates the disparate elements of life…that makes itself deeply felt” (193). On the one hand, the adventure is a dropping out of the continuity of life, something like a “foreign body in our existence” (188). On the other hand, Simmel also describes it as the fact that there is a feeling of a “subject other than the ego” taking hold (188). Although this could imply that the adventure possesses the subject in such a way as to render it foreign to itself, what is being emphasized is the fact that the adventure has an organic unity and motivation that precisely makes life foreign to its constituents: “This factor of decisive boundedness…is not mechanical but organic: just as the organism determines its spatial shape not simply by adjusting to obstacles…but by the propelling force of a life forming from inside out” (189). The adventure is organic because it does not result from a succession of incidences with a before and after, but short-circuits the difference between the two in its ongoing individuation. Thus this foreign body, this alter ego, comes to designate the principles of an individuation that grafts onto that of the physico-biological: it proceeds as a modulation of the individual. The adventure allows us to “forcibly pull the world into ourselves”, but this incorporation itself requires a certain form of expenditure that requires a certain flexibility or plasticity on the individuals undergoing the adventure (193). Indeed, while the adventure is a form of experiencing rather than a content, it also implies that the subject is rife with experiential tension (197). This is what allows for an event to be raised to the level of adventure (198). While this tension again evokes this notion of a foreign substance in our lives, it also points out that Simmel has an early conception of metastability, which is formulated almost thirty years later and which he is using in order to explain how the adventure is not a simple accumulation of events. This tension, qua metastability, implies that the adventure calls for an ongoing restructuration of the forms and media of the individual’s experience. Whereas an everyday love encounter does not constitute an adventure, the love that puts our lives and existence in a new perspective fraught with tension, perhaps not yet actualized, is akin to what Rilke’s torso of Apollo requires of us: that we must change our lives. Yet the adventure is not an ultimatum to our existence per se, but the challenge of life to continue to encounter and undergo unprecedented transformations that do not leave the stability of the ego (or the individuated being for that matter) intact. And since new and unprecedented forms of experience, those forms which alone are adequate to the adventure, are rare, one must reserve enough plasticity within one’s potential reserve to survive or even merit the metamorphosis. This is why “The Adventure” ends with the juxtaposition of the youth against the old. Youth privileges process over substance and takes delight in the feeling of its power, almost in the sense in which Simmel describes the will to power qua life as seeking the feeling of being more alive (198). On the other hand, old age relies more on substance, for it has already spent a large quantity of its energy reserves in the maintenance and perpetuation of its own structuration. Paradoxically, the more the individual progressively structures itself, the more stock it has for future individuations and the less able it is to cope with metastable situations in which it has to undergo a critical phase involving the resolution of incompatibilities. As Simmel says, the old rely more and more on the center of their substance while the “accidents” of life become more and more marginal, failing to garner the potential to be fully integrated in a way that lifts experience out of its quotidian framework of existence (198). Because of this reliance on substance, accidents in life lose the ability to form that experiential tension that forces a life to integrate these external and internal incidents as necessary[vii] (192). This is what Deleuze might have called the ethics of the event, insofar as it requires for beings to be resolute in the midst of the adventure so as not to be unworthy of what happens to us (Logic of Sense, 145). It is towards this end that Simmel will argue that, for very special types, the adventure can be conceptualized on the basis of life itself, such that the whole of life can be seen as an adventure. The analogy is fitting because it indicates that Simmel understands that the fundamental elements of what make the adventure unique are also those that are valid for the logic of the individuation of life itself. They are both ongoing processes that do not begin or end with fixed boundaries but are responsible for the resonating of these boundaries and for the overcoming of the latter. The adventure is not “change” in the facile sense, but a series of becomings-resolute towards the contents of life itself, perhaps a new vessel with old wine, but which, nonetheless, intensifies and accentuates the latter in a way that leaves it such that it cannot be called the same or even similar. The adventure is not the state of psychedelic intoxication, but the very preparedness of our vital lives to succumb and ascent to that which within us has primed us for the forms of heightened intensity in our awareness and capacities of affecting and being affected. Ultimately, perhaps when Simmel is juxtaposing the youth against the old, he is remembering a sober realization that Nietzsche had reached only two decades earlier: the exhaustion of an individual or the degeneration of a race follows from the fact that cultural and social energies have been wasted in the pursuit of war and struggle, thus ruling out the heightened capacity for being affected and for undergoing new and positive transformations. Here it seems that the forms dominate life without the means for the resolution of conflicts and crises that face it. The profound consequences of the form of the adventure will take on deeper significance in Simmel’s chapter on “The Transcendent Character of Life” and “The Conflict in Modern Culture”. Although dozens of books could devote themselves to these texts alone due to their sheer depth and richness, it should be noted that, like an adventure, they bring to the forefront many of the elements of Simmel’s thought in such a way as to accentuate and resonate with his other works. This can be seen easily by realizing that Simmel does not finally come to the question of life and form in these texts after everything, but instead that these questions themselves have been there all along. For example, it could be said that Simmel never fully approved of separating form and content in a hylemorphic model, even if for the expediency of scientific legitimacy, such that life—as a concept and more-than-concept—never stops coming to the forefront to remind Simmel that all these conceptualizations in fact betray its essence. Simmel will admit just as much when he notes that conceptual forms are not appropriate for dealing with the idea of life. Simmel writes: “intellectual life cannot but present itself in forms…But these forms enjoy in the very moment of their emergence an objective significance of their own…with which they confront the life which created them” (“The Transcendent Character of Life,” 370). Just as Simondon argues that concepts are only good for individuated reality (i.e. forms) and are not valid for understanding pre-individual reality[viii], Simmel argues that conceptual antinomies arise “whenever immediately lived reality is projected onto the plane of intellectuality” (367). Thus the intelligence is able to work easily on the level of individuated forms, but balks at the ontogenetic destruction and creation of these forms, especially since they constitute one and the same, “cosmic, generic, singular phenomenon” (366). This is why Simmel fully emphasizes the fact that the “essence of life is the transcendence of itself”, for by becoming aware of these antinomies through mental and creative life and positing them in and beyond their unity, we hit upon “an absolute concept of life which subsumes within itself that dichotomous characterization” (368). It is by overcoming the dualism of vital force and form that life can be understood as transcending itself on mental and physiological levels (but also the biological and the social, which are coextensive with the former and the latter) (371). It is striking that Simmel tries to think the self-transcendence of life as both mental or creative and life as physico-biological, for they share in the vital force that both animates and threatens them from without and within. The approximations of mental life in its attempts to grasp its own vital flux itself are continually shown to be lacking, thus requiring them to also be transcended: the fact that we have an intimation that “the world might not wholly enter the forms of our cognition…represents a movement of the mental life over itself” (357). It is not necessarily the old formula of Socrates that our knowledge is knowing that we know nothing. Opposed to such a generic way of characterizing mental life, Simmel argues that in our attempts to grasp this life = X, we precisely see that we cannot grasp this X, thus providing a transcendence of mental life but also the conditions of possible of creating form anew. This ability both to transcend and then to seek out the grounds for new forms fully characterizes what Simmel calls “the freedom of the human spirit”, i.e. “form-giving creativity” (“How Is History Possible,” 5). This creativity—which perhaps can be understood as the psycho-social grounds for new individuations of knowledge, cognition or even sensation analogical with the vital domains—proves that the mind itself is “something absolutely vital” (“The Transcendent Character of Life,” 358). There is truly a struggle between life and form here on the level of the mind or spirit, a question of penetrating the forms of life as such, but this penetration should be thought of as positive and not destructive, insofar as it provokes the grounds for the creative innovation of new forms, extending the psychological, social and the mental in their chasing of the life that is continuously reaching-out-beyond-itself. I have coined the rather ugly phrase “trans-epistemo-ontology” (perhaps the title of my haiku?) in order to talk about what future studies concerning the Simondon-Simmel conjunction should scout out from the paths that we have trekked above. On the one hand, epistemo-ontology emphasizes, for example, that for Simmel there is a struggle between the forms of knowledge and the formative formlessness of life. On the other hand, as “lived” and “trans-“, it also suggests the way in which it is a “struggle of life for self-identity” through its self-transcendent character (“The Conflict in Modern Culture,” 382). This struggle for self-identity is itself lived insofar as the “object of all knowledge must be transformed into life” (387). Stringing all of these together in order to justify this neologism, it is a question of knowing if the vital principle of individuation itself allows for Simmel to be on the verge of thinking the “differences of degree” among the human and natural sciences, for example, towards thinking all these forms of knowledge as involving not an analogical structure, but perhaps an analogical operation, for example. In a similar vein, Barthélémy writes concerning Simondon: “The sciences are precisely those of fully ob-jectivizable structures, which is precisely not individuation if the knowledge of individuation is itself individuation of knowledge[ix]” (13, author’s emphasis). While the sciences think structures that can be identified via their forms (e.g. morphology) they still require an allagmatic theory which would be concerned with operations (allagma meaning exchange or interchange, thus evoking Simmel’s Wechselwirkung). Simmel finds the allagmatic operation at work on structures in terms of play (a key notion of interaction) in his essay “The Transcendent Character of Life”: “life cannot lose itself in form. The achievement of every structure is at once a signal to seek out another one, in which the play…is repeated” (370). Strikingly, Simondon echoes Simmel by writing that an operation is “the conversion of a structure into another structure[x]”. Thus the notion of a trans-epistemo-ontology would delve into questions concerning the unity of the psychic, the social, the vital and the technological on the basis of individuation. This basis leads beyond having to settle for the purely sociological or the purely psychological, pushing beyond towards the trans-individual domain which provides a further individuation of the individual beyond the simple inter-individual relation to other individuals. Simmel is himself already thinking about the questions of the individuation of the group, its sub- and super-ordination, beyond those of simple relations among individuals. By thinking through the individuation of the group to the trans-individual without reducing this level to the culmination of the species or the form that society takes, Simmel can continue the forego the opposition between the psychological and the sociological, which are extreme, limit or “pure” cases. Thus, just as there exist analogies between the biological and the social, the psychological and the artistic based on their vital unities of reciprocal interaction, so these analogies, guided by a theory of operations on all levels, can serve for the hypothetical reconstruction of a ‘unification’ of the human sciences. If the differences of degree between the human and natural sciences can be reduced or translated on the basis of a knowledge of individuation, then this would serve at least as a potential project for the self-transcendence of mental life over its own conditions, namely the formal conditions of being outstripped by the reality of life. The biological, technological, physico-chemical domains of knowledge could all be projectively understood in terms of their operations as limits cases of the same vital source. Again, it cannot be a question of reducing life to its forms or of reducing these forms to any sort of stable identity, but of raising the threshold of cognition to the point where life itself can be seen as translating and individuating the forms themselves and then life again translating these forms back into itself for the benefit of knowledge. [i] Indeed, Simmel will confirm in “The Problem of Sociology”, which is also from the tome Soziologie, that the “givens of sociology are psychological processes” (35). This is an indication of Simmel’s disregard for overly opposing sociology and psychology in what would perhaps result in merely abstractions. Furthermore, the validity of the analogy between the natural, biological or physiological and the sociological—which can be found throughout Simmel’s writings and is, for us, a sign of strength and consistency in his thinking life as a multifaceted but singular phenomenon—stems from the fact that sociology also asks questions concerning the “elements of the life of humanity”, seeing the latter as an abstract idea similar to ‘nature’ or ‘society’, and thus in need of determinacy and elaboration. The continuity of the natural, the human and the social is emphasized with Simmel’s key questions: “What preconditions must the entire species have attained for this to be possible? What has humanity as a biological, ethical, and psychic type thereby won or lost in value?” (“The Categories of Human Experience,” 39). This broad way of considering the problems of sociology will even allow Simmel to posit that there is only a “difference in degree between the studies of man and the sciences of external nature” (32). Moreover, it will allow him to think interaction and exchange as the basis for value beyond the mere reductive interaction of individuals or the individual and society. [iii] The accusation of Simmel using a “biological” metaphor may seem valid on the face of things, but notice that Simmel does not simply equate society, but sociation, with organism. An easy attempt to resolve the problem would be to suggest that Simmel really means organization, or means to imply organization, by referring to the organism. Nevertheless, this would seem to undermine the emphasis that is being placed on the notion of sociation as involving reciprocal relations, namely that the principle of interaction constitutes an evolving form of life, rife with potentials and tensions. Simmel will write in the chapter on ‘Exchange’ in the Philosophy of Money: “Society is the generality that has, simultaneously, concrete vitality” (69). Precisely because of reciprocal interaction, life does not end with the body of the individual, but extends beyond while at the same time extending the individuals. [iv] Cf. the preface to the second edition of The Philosophy of Money where the editor points to a quote by a contemporary of Simmel who finds so many analogies to be unsettling and perhaps to undermine their argumentative appeal (l). Here we will simply note that one of the strongest affinities between Simmel and Simondon in terms of their theory of knowledge or cognition (epistemology) and their theory of regions of being (ontology) seem to be mutually supportive and also have the striking characteristic of using analogy as a specifically philosophical mode of thought. Although we will not be able to cover this subject adequately, for Simmel the analogy may simply be the most rigorous trope for securing the identity of knowledge and external reality; whereas for Simondon, the analogy is the proper mode of thought of the philosophical enterprise. [v] Here we would be remiss if we did not notice the striking, if perhaps superficial, concept of the Body without Organs formulated by Gilles Deleuze and Felix Guattari. Although there is no place for it here and the connection with Simmel may be speculative, it should be noted that the similarity and resonance among the thinkers becomes more convincing when examined in light of Simmel’s dense chapter on “The Transcendent Character of Life.” Future attempts to align these thinkers on the question of life would find it profitable to extend Deleuze and Guattari’s notion that the BwO is not opposed to the organs but the organism in order to begin to examine Simmel’s antinomy (on the conceptual level) between life and form. [vi] However, while Nietzsche would understand this concept of modulation in terms of becoming, Simondon himself thinks of becoming in terms that imply incompatibilities and their resolution. Nevertheless, there is nothing wrong in thinking modulation in terms of becoming, for the former is a mode of the latter. The terms should be distinguished, however, insofar as their seeming interchangeability may lead to a reductionist opposition of molding qua being and modulation qua becoming. In any case, it is significant to recall that Simmel himself does not seem to gravitate towards using terms like being and becoming, even though they would have been extremely familiar to him. On the one hand, they lack the specificity with which he wants to endow his forms of interaction, and, on the other hand, they reproduce a sort of Hegelian systematizing that is refreshingly absent from Simmel’s texts themselves, even if he relies on synthesis and analysis (which may be more of a Kantian influence) and even though he sometimes tends to fall back on a usage of Aufhebung and contradiction. Perhaps the most meaningful correlation between Simmel and Simondon on analogy is the fact that the latter seems to undercut any surefire method towards the accumulation of Absolute Knowledge, which for both of these thinkers would be cut out at the root from life itself. Hence in Difference and Repetition, Deleuze counters Hegel’s claim that knowledge should be absolute with the idea that learning should be a continuous process, insofar as it does not culminate in the absolute. The result is strikingly similar to Simondon’s implosion of the hylemorphic model, because it emphasizes the interaction of learning that enables the individuation of knowledge to take place, which in Hegelian terms always seems like the byproduct of a process and not the process itself. [vii] Here it would be wise to indicate in what sense Simmel’s reflections on the young and old run close to the way in which Barbara Stiegler in her Nietzsche et la biologie interprets the fundamental antinomy in thinking Nietzsche’s will to power: either the will to power in its traversal of all living beings is opposed to death and is excepted from death in the permanent growth of its own power, or death is at the very heart of organic individuation and therefore also at the heart of the will to power (75). For Simmel, death and resurrection are at the heart of the self-transcendence of life and the real eternity is in the individual’s propagation of the species, while for Simondon it is precisely the will to power of the principle of individuation that leads individuals to succumb to a degradation that would force them to release their energy and elements up for the individuation of future individuals. [viii] Simondon, Gilbert. L’individuation à la lumière des notions de form et d’information, Grenoble: Jerome Millon, 2005, p. 27. [ix] Barthélémy, Jean-Hughes. Simondon, ou l’encyclopédisme génétique. Paris: PUF, 2008. [x] Simondon, Gilbert. L’individu et sa genèse physico-biologique. Paris: Presses Universitaires de France, 1964, p. 263.